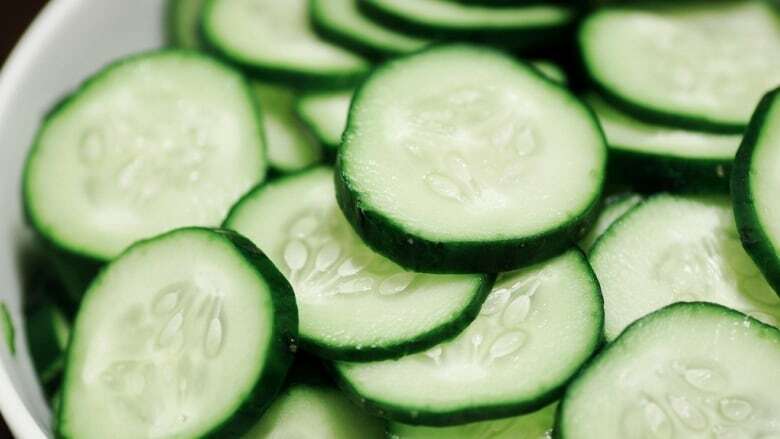 Public health officials in five provinces are investigating a salmonella outbreak that has affected 45 individuals, some of whom ate cucumbers, although other sources are being investigated. Public health officials in five provinces are investigating a salmonella outbreak that has affected 45 individuals. The Public Health Agency of Canada (PHAC) said that as of Oct. 19, 37 laboratory-confirmed cases of Salmonella infantis illness were being investigated in British Columbia, with five cases in Alberta, and one each in Saskatchewan, Manitoba and Quebec. The individual from Quebec reported travelling to B.C. before becoming ill, a news release says. Many of the individuals who became sick reported eating cucumbers, but other potential sources are also being considered. PHAC didn't give any other details on where the foods that may have been behind the outbreak were purchased. Nine people required hospitalization, but no deaths have been reported. All incidents occurred between mid-June and late September. The health agency said the outbreak appears to be ongoing, as illnesses continue to be reported. The Washington State Department of Health said Friday it was investigating six cases of salmonella infections there. In a statement, the agency said five of the six people reported buying and eating English cucumbers from various Costco stores in Washington. The cucumbers linked to the illnesses were sold in three-packs of individually wrapped cucumbers. PHAC said it is working with the U.S. to determine whether there are commonalities between these two events that can help to identify the source of the Canadian outbreak. Wash hands with soap and warm water before and after handling fresh produce. Cut away bruised or damaged areas on fresh produce. Clean your knife with hot water and soap before using it again. Wash fresh produce thoroughly under fresh, cool, running water. Don't soak fresh produce in sink full of water. Use a clean produce brush to scrub items that have firm surfaces (like cucumbers, oranges, melons, potatoes, carrots). It isn't necessary to use produce cleansers to wash fresh fruits and vegetables. Use one cutting board for produce and a separate one for raw meat, poultry, fish and seafood. It can take several weeks from the time a person becomes ill to when the illness is reported and testing confirms a link to the outbreak. Symptoms — which can include fever, chills, diarrhea, abdominal cramps, headache, nausea and vomiting — usually last four to seven days. In healthy people, salmonellosis often clears up without treatment but severe illness and hospitalization may occur. People who experience symptoms, or who have underlying medical conditions, should contact their health-care provider if they suspect an infection.